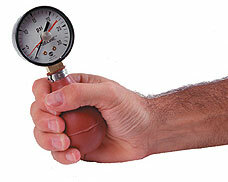 The Baseline® squeeze (bulb) dynamometer is the inexpensive way to measure hand and finger strength. The dynamometer is available with and without an indicator (reset) pin that remains at the maximum reading until reset. Unit is calibrated in PSI (pounds-per-square inch).